UNISON believes that our members deserve a fair pay deal, backdated to 1st April 2018. 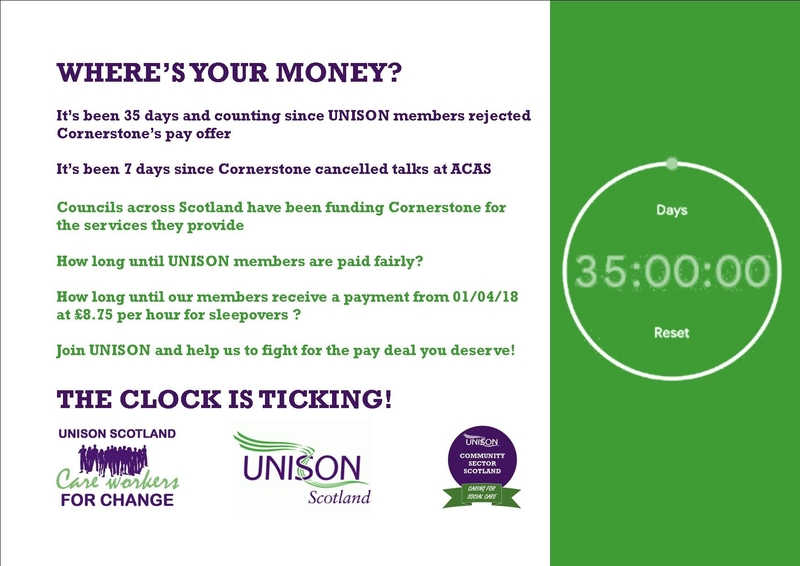 It’s now been 35 days since you rejected Cornerstone’s pay offer, and a week since Cornerstone refused to negotiate with UNISON at ACAS. To be clear: UNISON is prepared to meet Cornerstone at ACAS on a moment’s notice to thrash out a fair pay deal for our members. It’s apparent that Cornerstone’s decision to derecognise UNISON means less money in our members pockets, and that is clearly unacceptable. So our message to Cornerstone is simple. Do the decent thing and negotiate a fair pay deal without delay!